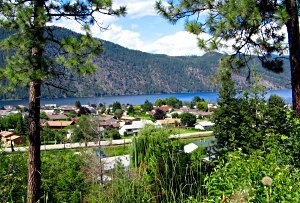 The gateway to BC's North Shuswap, Chase is a small community with a lot to offer. Located just 56 km (34 mi) east of Kamloops on the western end of Shuswap Lake, Chase can offer the outdoor enthusiast a variety of activities. The community of Chase, with its warm summer days, has a golf course, beautiful beaches and parks, while the nearby lakes, rivers and mountains can provide everything from hiking, camping and mountain biking to water skiing or salmon watching. Accommodations: There are a number of private campsites as well as BC Provincial Parks: the Adams River Provincial Recreation Area; Shuswap Lake Provincial Park and Niskonlith Lake Provincial Park. There are also resort hotels/motels in Chase and in the immediate area. Access: The nearest large community is Kamloops, BC, 56 km (34 mi.) to the west on Highway 1. Greyhound Bus Lines makes a stop at Chase, but the nearest airport is in Kamloops. From Vancouver, BC, or points north, follow Highway 1 east from Cache Creek (140 km/ 84 mi.). Recreation Facilities & Activities: local park; swimming and picnicking beach areas; river rafting; Roderick Haig-Brown Provincial Park; boating; golf course; hiking; mountain biking; exploring.